Yes, that show is still on. Perhaps more than any other show on TV today, Grey’s Anatomy is the one that, when you mention it, practically forces conversationalists to reply, “That show is still on?” I’ve seen it happen countless times, to myself and to the dedicated troop of people I know who still watch the show without fail every week. The question is always asked with its condescension not just intact but proudly on display; there is steel in the detractors’ voices, a surety that something so populist, so long-running must have long ago caved to an inevitable decline in quality or relevance. But nothing could be more wrong. In fact, Grey’s Anatomy’s quality has strengthened and deepened over time — as a result, it has seen a ratings surge in its current season, which ends this Thursday — and its supposed frivolity is one of the great myths of our current viewing era. The generally accepted, superficial understanding of Grey’s Anatomy is this: It premiered in 2005 as a mid-season quirk on ABC as the first show by an ambitious creative force named Shonda Rhimes. The early reception of Grey’s matched its theme song at the time, Psapp’s “Cosy in the Rocket”: that of a shiny toy, all clicks and clacks of candy-coated energy. Because of the light fun of its medical cases and the tryst that quite literally began its story line (the young, beautiful intern Meredith Grey has a one-night stand with Dr. Derek “McDreamy” Shepherd, who turns out to be the attending brain surgeon at the hospital where she works), the full impact of Grey’s ethnically diverse casting was somewhat softened, however deeply embedded in the show it was. (Over the years, Grey’s has introduced us to an ever-widening cast of characters from various backgrounds, cultures, and sexual landscapes.) This, in turn, made the show’s importance easy for certain critics to dismiss: Here was a program that took the serious tone of a hit like ER and turned it into feel-good entertainment. And because the focus of the show was interns, not full-fledged doctors, it brought youthfulness to the proceedings — youthfulness that often misread as a lack of gravity. After all, the interns of Grey’s were not what we think of when we imagine doctors. We think of focused professionals, fully formed and assured and, above all, never wrong about anything that they may be doing in a hospital room or on an operating table. But these versions of medical professionals made plenty of mistakes. In the most memorable early example, the fidgety, nervous George O’Malley earns the dubious nickname “007” because his errors almost lead to the death of the first person on whom he performs surgery. This made for diverting television, but it also subconsciously played to our worst fears: What if we went to the hospital with an emergency and were treated by people who might very well kill us with their incompetence? The subconscious reaction from many was to treat the show as if it were mere fantasy, a trifle. But over the course of its 12 seasons, a crucial part of the show’s DNA is largely overlooked when people discuss its content: Grey’s Anatomy — both the show itself and the narrative that it tells — is the story of a business, well-run and successful despite the numerous challenges it has faced. And to tell this story, Grey’s has kept evolving creatively over time. This is because, more so than anything, Grey’s is the result of Shonda Rhimes’s particular worldview as an innovator in the medium of TV. Indeed, back in 2012, when Rhimes appeared on Oprah’s Next Chapter, she stated quite plainly, “I think I’m most proud of the fact that I have figured out how to exist as both a creative person, an artist, and a businesswoman, and a manager.” This is something Rhimes gets at in her wonderful and best-selling memoir/creative manual, Year of Yes, and it is one of the reasons why the character of Cristina Yang, perhaps the ultimate embodiment of aptitude mixed with levity on the show, is the character closest to her actual personality. (The fact that Sandra Oh never won an Emmy for her portrayal of Cristina Yang — one of the most compelling and challenging characterizations in the history of TV — continues to be an oversight of mind-boggling proportions.) Think of the coordination and sheer acumen that must go into casting a show with this many story lines, characters, relationships, and medical emergencies. Staffing the show, with all of its actors, writers, directors, and producers, is, in and of itself, a gargantuan undertaking that speaks to Rhimes’s considerable know-how as the head of Grey’s Anatomy, Inc. More importantly, the show’s creative content reflects this. Throughout the series, the fate of the hospital that provides its setting has been tested and contested. In a memorable plotline in season five, the hospital was forced, due to financial hardship, to merge with another Seattle-based establishment; the ensuing merger led to the renamed Seattle Grace-Mercy West. The same plotline included the layoff of countless nurses and other staff, a harrowing occurrence that spoke to the prevailing economic climate at the time. And later, after one of the series’ most prominent, intentionally shocking, and controversial events — a plane crash that claimed two long-standing and beloved characters’ lives and led to a potential legal nightmare for their once-employer — the hospital had to be bought out by a septet of its most important doctors, who then formed a kind of All-Stars board of bosses. This was art mimicking the complexity of the business apparatus that had produced it. In other words, all of these machinations within the plot seemed to nod to the daunting task of running a network TV success like Grey’s in the first place. The story of Grey’s Anatomy, the Network Juggernaut, is also dependent on an awareness of its cultural context. The Grey’s creative team has made smart decisions in how it handles issues that are culturally important and relevant to a larger conversation at any given time, in ways that nevertheless make sense for the show. Most recently, in the current season, there was a pitch-perfect scene in which four of the female doctors in the hospital — including a straight African-American cardiac surgeon and a bisexual Latina orthopedic surgeon — discuss why they feel bias working against them when they ask for higher salaries, whereas their male counterparts never have to deal with such a thing. (If you don’t understand why a conversation like this on network TV is important, you’re about as woke as Rip Van Winkle.) In general, Grey’s consistently uses its platform as one of TV’s most visible modes of ethnic and cultural representation to present characters who credibly and humanely challenge our preconceived notions of what certain people can and cannot do. This has been especially true of how it handles LGBT issues. The relationship between Callie Torres and Arizona Robbins has been the most obvious example of this, but there have been key episodes in which medical matters have delved into more unexpected issues — take the season-six episode in which the show explored the early onset of the AIDS crisis, and the season-11 episode in which Dr. Ben Warren’s sibling came out as a transgender woman. Beyond being mere plot points, how the show takes on such major events have demonstrated Rhimes’s fundamental knowledge of how organizations fail or succeed: In each of these circumstances, uncharted yet vital territory had to be explored and examined in a fresh, unique way, with the tone of the show modulated to match the content. All of this is achieved, of course, without losing the specific brand of humor that has always been infused into the show. But perhaps the greatest demonstration of its sturdiness as a creative endeavor are the ways in which it has handled the loss of key team members. I mean, of course, the departures of some of its main characters, played by actors who are now infamous for the personal problems they allegedly brought to the set. There was the alleged homophobic slur delivered by Isaiah Washington that led to the exit of his previously beloved character, Dr. Preston Burke. There was the conflict between Katherine Heigl and Rhimes, the pinnacle (or nadir) of which was when Heigl withdrew herself from Emmy contention after deeming the material that she had been given in season three subpar (“I did not feel that I was given the material this season to warrant an Emmy nomination …” This was after she had won an Emmy the year before, by the way.) And most recent, there was the cataclysmic death of “McDreamy,” Meredith’s aforementioned brain-surgeon boss and eventual husband, when actor Patrick Dempsey’s personal problems allegedly had a negative effect on the on-set atmosphere. It is worth noting that, regardless of the circumstances under which these cast members left the show, the treatment of their characters avoided letting them simply fade into the ether (pun intended). Instead of scraping away all trace of Dr. Burke, the show has him loom large in Cristina Yang’s memory for the rest of her many seasons on the show, and he is constantly referenced and contrasted outright to her other great love, Owen Hunt. Even Heigl did not suffer erasure: Izzie Stevens’s departure has resonated throughout every subsequent relationship that her husband, Alex Karev, has had. Season 12 has accomplished the truly remarkable: Instead of declining in quality and poignancy after Dempsey’s abrupt exit, it has revealed an intricate and unflinching portrayal of Meredith Grey as a woman of great intelligence who doesn’t just pick up the pieces, but reassembles them into an exemplar of resilience and, even, good humor about her fate. Characters are essential to the functionality and integrity of Grey’s as a creative construct, and likewise, they take precedence when matters about the show’s direction are decided. Similarly, the general method by which Grey’s Anatomy handles its numerous plot threads relies on a two-pronged approach: 1) The depiction of large-scale, immediate traumatic events; and 2) The depiction of smaller, personal traumas with which the central characters must deal subtly and for longer stretches of time. It is the first of these two approaches that brings the most contemptuous criticism from Grey’s agnostics: How many insane, catastrophic moments can happen to these characters in such a short period of their lives? The events in this category are the ones of which you are probably aware even if you don’t watch: an undetonated bomb left ticking in a patient’s body cavity (the famed “Super Bowl Episode” of season two that transformed the show into a ratings wonder); a ferry boat incident in season three during which Meredith Grey goes missing; a crazed father of a deceased patient who, in season six, comes back for revenge on the hospital with a gun in hand; that plane crash at the end of season eight/beginning of season nine. These are sweeps episodes, usually, and they lead to mass tune-ins and optimal ratings. Yet the show is incredibly self-aware when it comes to how dramatic these catastrophes are. In a particularly funny scene after that ill-fated plane ride, Cristina mouths off to Meredith, “If there is one thing that I have learned with the bombs and guns to my head and buses running down my friends, it is that I am not interested in dying! … As soon as we get out of here, I’m getting the hell away from Seattle Grace Mercy Death!” This is Shonda Rhimes fan service at its best: fully conscious, humorously delivered, all-too-aware of the “these go to 11” nature of these traumas. It is what happens in the aftermath of these catastrophes, though, that displays the show’s greatest strengths; these are the more extended, personal traumas that fall into the second category and that make up the emotional core of the show. For example, the ways in which the characters deal with the physical and emotional repercussions of that plane crash are compassionate and heartrending (Callie Torres and Arizona Robbins’s struggle with Arizona’s amputation is but one example of this; the effects of Mark Sloan’s death is another). And season 12 has had to deal with the biggest curveball possible. Scores of fans were beside themselves when Dempsey left the show under shocking circumstances, and many vowed never to watch again. But instead of lessening the show’s emotional power, the ways in which Meredith has had to endure his absence while cementing her status as a brilliant surgeon, mother, friend, and colleague have only increased in complexity. Critics of the show love to invoke the season-two pull-quote in which Meredith desperately cries, “Pick me! Choose me! 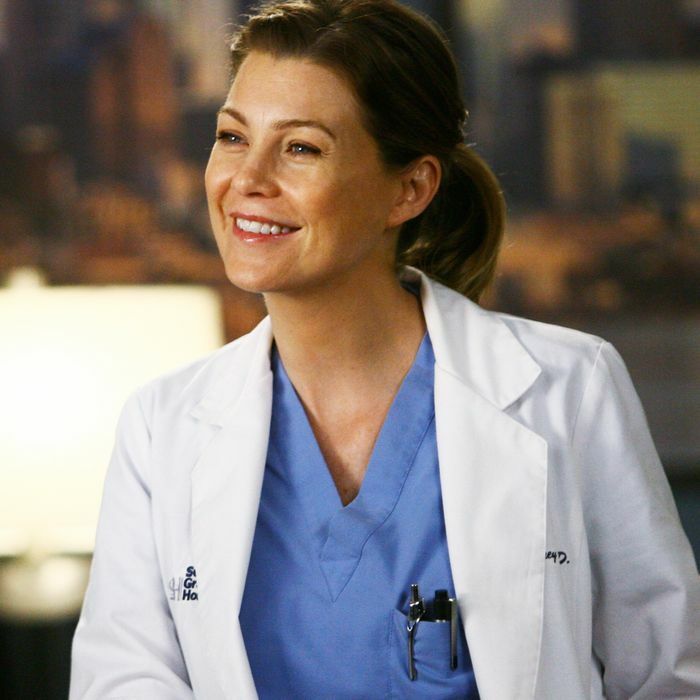 Love me!” to McDreamy, but that version of Meredith has not existed for years now. Rather, she has evolved into a powerful, exceptional doctor who is now, at this season’s end, exploring an idea of romance that suits her life and work best, and Ellen Pompeo is delivering a formidable performance that captures all of this. To be sure, Pompeo’s work should not be the only acting singled out as notable. Through all of its changes, through all of its plotlines, through all of its dozen seasons, Grey’s has managed to create characters that still feel fresh, distinctive, and surprising. Under Rhimes’s guidance, the longest-running ensemble members have continuously done fantastic work, from James Pickens Jr.’s alternately stern and amusing Richard Weber; theater emigrée and now-seasoned director, Chandra Wilson’s Miranda Bailey; another theater emigrée and Tony winner Sara Ramirez as Callie Torres; and Justin Chambers’s curmudgeon with a heart of gold, Alex Karev. Karev’s evolution, in particular, has shown a peek behind the curtain of emotional guardedness not unlike Meredith’s (and may be one reason why the platonic relationship between the two has always been tinged with a kind of slow-burn intensity). Kevin McKidd as Owen Hunt (and as a frequent director), Jessica Capshaw as Arizona Robbins, Jesse Williams as Jackson Avery, and Sarah Drew as April Kepner have, in the latter half of the series’ run, brought charisma in spades. Then there is the swath of supporting players who have provided humor and drama in equal measure. After a few seasons of rotating interns, the show has settled into one of its most compelling classes yet, led by the incomparable Jerrika Hinton as Stephanie Edwards, and Karev’s perfect sparring partner, Camilla Luddington as Jo Wilson. Most notably, Kelly McCreary as Maggie Pierce — part of a trio of sisters that now includes Meredith Grey and the great Caterina Scorsone as Amelia Shepherd — has fully established herself as the best and most logical keeper of the flame should Pompeo ever depart. And should Pompeo ever depart, as fans have worried for so long, we have proof, via season 12, that this show has a way of modifying its formula and format to accommodate new themes and relationships. That is the enduring legacy of Grey’s Anatomy: Its capacity for change while crafting long-tail, vivid storytelling that has resonated with so many of us for so long. And as long as it continues to do so, I’ll be watching as avidly as ever.